- FrancesCassandra: UK fashion, beauty and lifestyle blog. : Review: Montagne Jeunesse Travel Pamper Pack. 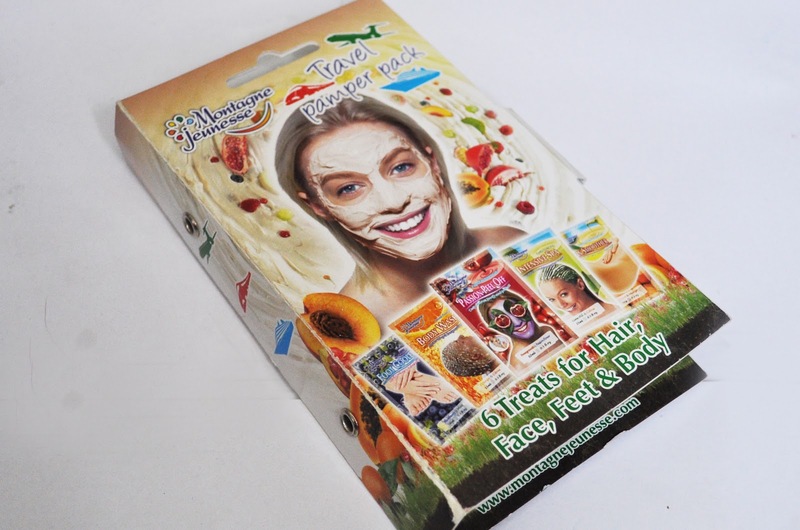 So with everybody preparing to jet off to some place sunny over the summer, Montagne Jeunesse have come up with a nifty little kit so that we can keep ourselves pampered whilst on holiday. 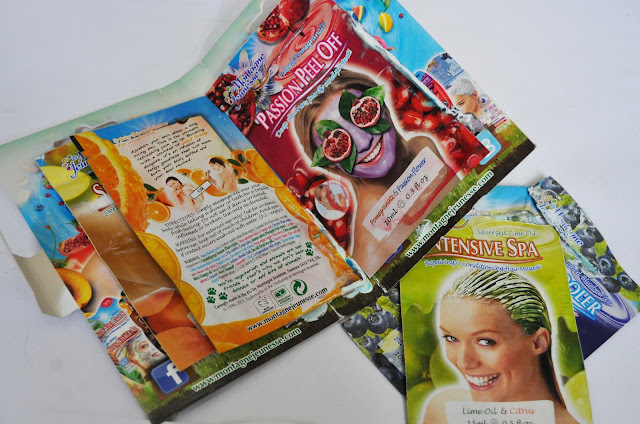 The Montagne Jeunesse Travel Pack contains six little sachets of fruity-fragranced treatments for your hair, face, feet and body, that will help keep you refreshed and feeling great in the intense heat. 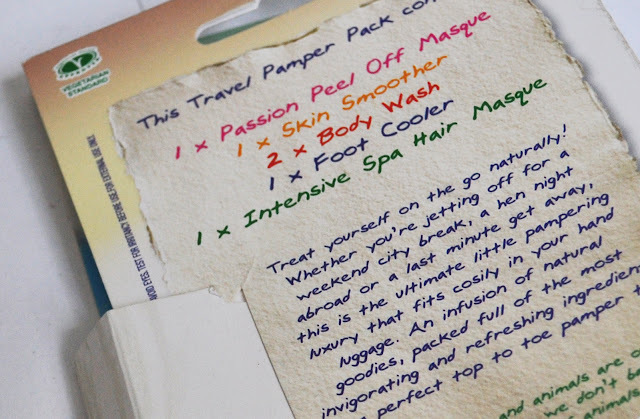 The products come in a handy travel-sized cardboard booklet, from which you can tear out the sachet of whichever product you want to use. I really like this as it is a perfect size to throw in to your bag or suitcase, and they are all kept together. I am not normally a fan of artificial citrus fragrances but this really does have a true orange scent. It is very refreshing to use both in the morning or after a long day out and it left me feeling clean, with a mild orange fragrance lingering on my skin. This was probably my favourite product in the pack. I love exfoliants that actually feel as though they are working, and the crushed apricot stones in this scrub are quite abrasive, although I don't think that they are too harsh. I find that with most scrubs, the exfoliating beads dissolve as use you rub them in, but these stay put so you can work them on to your skin for longer. This is the only product in the pack that didn't work very well for me. Like the body wash, it has a lovely, refreshing citrus fragrance, like lemons and grapefruit this time. My only issue was that there wasn't enough product in the sachet for my nearly waist-length hair, but I don't think that this is really too much of a fault, as these packets are travel sized and there would probably be enough product for people with short to mid-length hair. I used this product after two days of walking for miles in the hot weather that the UK has been seeing for the past week, and my feet certainly are thanking Montagne Jeunesse for it. The foot cooler comes out as a pale blue cream which smells of blueberries with a hint of mint, and feels so cool and soothing when massaged in to your feet. The cream turns to powder once it has settled on to your feet, and the cooling sensation stays around for a good 15-20 minutes. I am not normally a big fan of peel off face masks as they are usually very sticky and messy to work with, and this one was no different. It did smell amazingly of red berries, however, and once it was dry it peeled off easily and left my face feeling clean and smooth. Are you going on holiday this summer?What is your favourite Montagne Jeunesse product? These look gorgeous hun so summery and such a good price! i love this little handy size travel pack - shame i'm not going away this year YET,lol! I had the same problem with you, with the hair mask, my hairs long and thick two and you hardly got enough for your whole head, it didn't work to well for me. I love the sound of this and will def pick one up even though I haven't booked a holiday yet!